SEER or Seasonal Energy Efficiency Rating is a measure designated by the U.S. Department of Energy and gives you a good idea of the performance you can expect from Air Source Heat Pumps/Mini Splitss. At a 16-SEER cooling rating, the Amana® brand ASZ16 Air Source Heat Pumps/Mini Splits can deliver an up to 9.0 HSPF (Heating Seasonal Performance Factor). When you choose an energy efficient Amana brand Air Source Heat Pumps/Mini Splits, year-round indoor comfort is combined with year-round savings compared to lower SEER. LG home comfort solutions allow you to cool or heat your entire home or a single room based on the needs of your space. Stay comfortably warm during even the coldest winter days with industry-leading LGRED° (Reliable to Extreme Degrees) Heat Technology. Products featuring LGRED° heat technology boast superior heating performance: 100% heating capacity performance down to 5°F and continuous heating operations down to -13?F! This increased performance not only delivers heat when traditional models are unable to but also operates with incredible efficiency; making products with LGRED Heat the ideal heating solution for less temperate regions of the country. LGRED also feature a SEER rating of up to 21, qualifying them for ENERGY STAR® certification, as well as eligibility for participating local utility company rebates. With both ducted and duct-free options available in single and multi-zone configurations, LG residential and light commercial solutions are perfect for a number of applications. Whether it is simply supplemental to an existing system or a complete multi-zone infrastructure in either a retrofit or new construction, LG’s superior design flexibility and performance allow contractors to install the solution that best suits the specific application’s needs. 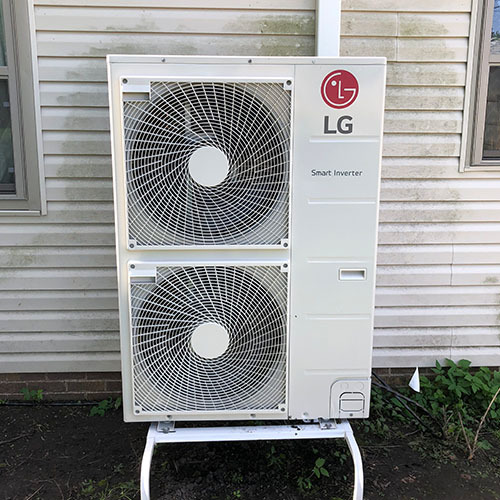 New Construction & Design-Build - With a greater emphasis on energy efficiency LG systems are perfect for new construction and design-build homes that are looking to lower operating costs while maximizing design.